In 1990, Mahlon Hochstetler began his career in woodworking and set in motion a journey that would lead him to log home construction, all while adding valuable skills along the way. During his career Mahlon has worked in custom construction building custom staircases for high-end homes, as well as working in and ultimately managing a log home manufacturing facility. 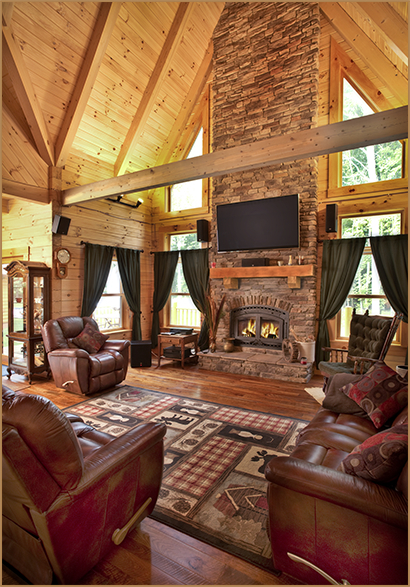 While still managing the log home production facility, Mahlon saw the need for a more elite class of custom log homes. The industry wasn’t meeting that need, so in 2002 Mahlon founded Buckeye Log Builders in order to meet that challenge head-on. In the beginning, Buckeye Log Builders only offered exterior shell construction, however as orders came in the need for a log home builder that went beyond shell construction became evident. So Buckeye Log Builders began offering general contracting services and complete turn key solutions. Mahlon’s true passion was realized as he became more involved in helping customers through the processes of picking the proper stone colors, flooring, counter-tops, and other accents to compliment the natural beauty of the logs. This ability along with his knowledge of various log species and their benefits has helped customers realize their dreams — and to do so while still on budget. At Buckeye Log Builders we want to use our experiences to your benefit, and help you in your journey to your perfect home. Specializing in high-quality, custom log homes.